Very well maintained beach home with private POOL. Located on the second row, just across the street from the beach! Relaxing four bedroom home with tropical landscaping and private pool. Recently renovated with an open living room and kitchen make the home feel 'beachy' and relaxing. Large flat panel TV in the main living space, comfortable seating and dining area. Kitchen is fully equipped with granite countertops, glass tile backsplash, dishwasher and side by side refrigerator, Keurig and crockpot. Ceiling fans, tiled floors and many extras in this home. Private pool is an oasis with plenty of seating. Large covered front porch with lots of seating and peek-a-boo views of the ocean. The beach access is only a few houses down. Other amenities include washer/dryer, microwave, wireless internet access, pack 'n play, patio below with gas grill, picnic table, swing and covered parking. Outside hot and cold shower. Non-smoking. Heat the pool for $75/day October - May. A perfect location for annual Oyster Festival weekend or Memorial holiday. This home is DOG friendly with a non-refundable deposit and is per dog. Sleeps 16. 4 Bedrooms, 2 Baths. 2 Queens, 2 Doubles, 2 Doubles, 2 Doubles. This home has all the bed and bath linens provided with beds made upon your arrival! 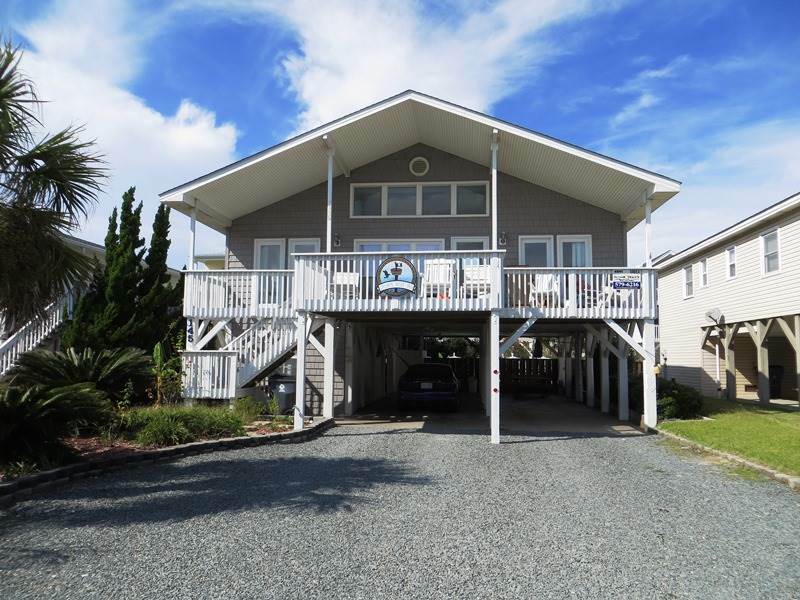 (NO LINENS DURING WINTER MONTHLY RENTALS)Very well maintained beach home with private POOL. Located on the second row, just across the street from the beach! Relaxing four bedroom home with tropical landscaping and private pool. Recently renovated with an open living room and kitchen make the home feel 'beachy' and relaxing. Large flat panel TV in the main living space, comfortable seating and dining area. Kitchen is fully equipped with granite countertops, glass tile backsplash, dishwasher and side by side refrigerator, Keurig and crockpot. Ceiling fans, tiled floors and many extras in this home. Private pool is an oasis with plenty of seating. Large covered front porch with lots of seating and peek-a-boo views of the ocean. The beach access is only a few houses down. Other amenities include washer/dryer, microwave, wireless internet access, pack 'n play, patio below with gas grill, picnic table, swing and covered parking. Outside hot and cold shower. Non-smoking. We really enjoyed our stay. The home is well equipped and located close to the beach, golf and great places to eat. Its very pet friendly with tiled floors and the porch has a latching gate we allowed us to sit out and enjoy the breeze from the ocean while our pets were able to safely enjoy it as well. We found a great dog park a short distance away in Shallotte. The only suggestion I have would be to add a sheet with some tips such as directions to places like the dog park and grocery stores. Also, things like should the trash containers be back to the home between pick ups, where to turn on the light to the pool. Maybe add where the public beach access points are those were very close and easy to spot but some may find that helpful The home is really nice and we hope to return.